Pintu Kota (the gate of the city) Lies between the villages Airlow and seri on the south coast of Ambon island. A huge rock stretching out to the sea with a hole at its bottom which looks like a gate where through it we can see the coast line and the Banda sea. 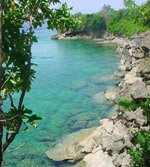 It is an ideal place for snorkeling and diving.